An exhibition of 365 images of contemporary Canadian design taken from a year long investigative project by Joy Charbonneau. On January 1st 2017, Charbonneau started a social media account for Instagram under the name @marianadesigncanada. 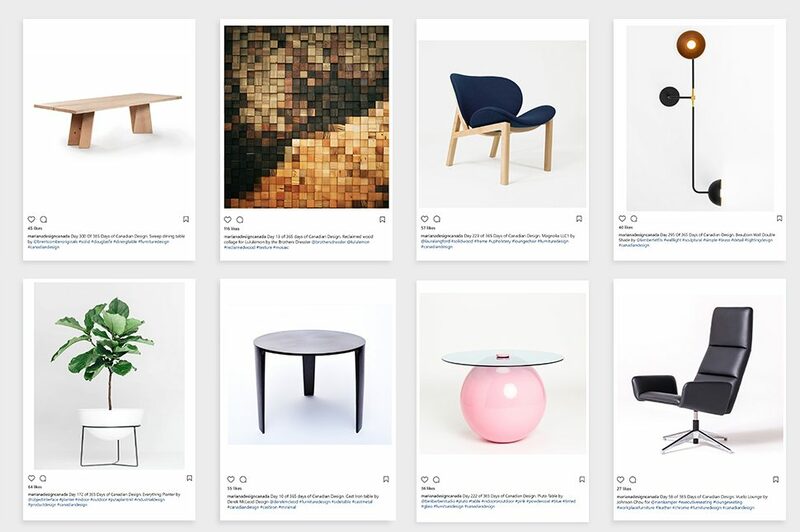 For every day of 2017, Charbonneau discovered and posted furnishings, ceramics, textiles, objects, and illustrations from over one hundred makers and designers from across the country to promote and celebrate Canadian design culture. Special thanks to KPMB Architects who made this exhibition possible. Amanda Rataj, Andrew Jones, Annie Tung, Anony , Anthony Frank Keeler, Alexandre Joncas, Alissa Coe, Ariana Mari Cuvin, Avril Loreti, Atelier Anaka, Ben Barber Studio, Bettie Cott, Bev Hisey, Bahar Ghaemi, Bill Reddick, Bocci, Brent Comber, Brent Cordner, Brothers Dressler, Castor, Chifen Cheng, Christiaan Planck, Concrete Cat, Coolican, Dear Human, Derek McLeod Design, Dieter Janssen, Division 12, Djuna Day Studio, Doublenaut, Dylan McKinnon, Dystil, Element de base, Era 66 Furniture, Fig 40, Gus Modern, Heidi Earnshaw, Hollis and Morris, Hunt Amor, IMM Living, IZM Design, Jacques Guillon, Jake Whillans, Jamie Wolfond, Jenna Stanton, Jeremy Hatch, Jessica Steinhauser, Johnson Chou, Joy Charbonneau, Kamal Fox, Kastella Furniture, Kate Duncan Design, Katherine Morley, Karice Enterprises, Ken Diamond, Kenneth Lavallee, Knauf and Brown, Kroft Studio, Lalaya Design, Lambert & Fils, Laura Carwardine, Laura Langford, Lauren Reed, Lori Harrison Design, Loyal Loot, Libs Elliott, Light Maker Studio, Liz Eeuwes, Lixht, Looks Like White, Lukas Peet, Mezza Luna Studio, Maiwenn Castellan, Majorie Camire, Martha Sturdy, Marian Bantjes, Matthew Kroeker, Matthew McCormick, Micah Lexier, Molo, Mosaika Mosaika, MSDS, National Design Collective, Niels Bendtsen, Nienkamper, Nick Chase, Noriko Masuda, Object Interface, Oliver Apt, Origins Work, Oscar Kwong, Paige Russell, Patty Johnson, Rob Petrungaro, Rob Southcott, Robert Sangster, Ryan Tomkinson, Sabina Hill, Sali Tabacchi, Shaun Moore, Shawn Place, Speke Klein, Simon Johns, South Street Boat Builders, SSSVLL, Tahir Mahmood, Tania Love, This or That Studio, Thom Fougere, Tom Deacon, Tuck Shop Co, Underline Studio, Uufie, Virginia Johnson, Watson Soule, Wronko Woods, Yabu Pushelberg, and Zoe Mowat.